My daughter is the avid fan in our family of http://www.OnlySimchas.com. OnlySimchas enables my daughter to instantaneously celebrate with our old community in Canada as OnlySimchas provides a visual feast of all the latest simchas. 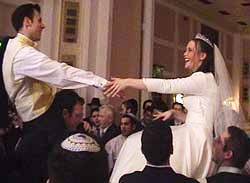 That is precisely the objective of OnlySimchas as written in the OnlySimchas’ mission statement, “to spread joy by listing weddings, engagement, births and announcements of other happy times so that they can be shared with others around the world.” OnlySimchas then is a very important tool for the global Jewish community – or is it? I had never really pondered this question before until I started to wonder if all the tools of our computer generated world is desensitizing us to the enormity of our life changing, passing of rite celebrations. OnlySimchas is another tool to link us to the rest of the world with a click of the mouse so what is OnlySimchas really doing to our sense of simcha? Ah, the old fashioned dream of romance; the idea that within our fast paced world we are still able to think towards and aspire to an island of escape, that there is still a time in our lives that we can stop and contemplate in stillness and silence a partner in our lives, that together we see a future of love, marriage and children, built on this moment of oneness –and together, the two of us alone, make an awesome pledge. And then comes along onlysimchas.com a website that just seconds after this powerful, private, intense moment blasts photographs all over the world for people who barely know. Is there a whole world of OnlySimchas users idling around during their work break, or OnlySimchas friends hanging out with nothing better to do then to check in at OnlySimchas and get the latest scoop? Is this a cynical take? Let’s take it a step further. Perhaps now, the fame of being on OnlySimchas is going to people’s heads so the first thing after becoming engaged is to get their photographs out onto OnlySimchas as fast as possible. This is not so far fetched because there was this wonderful article called “G-d only (Simchas) knows from The Daily Bang which described the plight of the world when the server for OnlySimchas crashed. This tongue-in-cheek article brought up some very astute reminders of what the world can come to when OnlySimchas takes over. A couple in the yichud room called OnlySimchas to find out why they could not look at the pictures of their chuppa already downloaded onto OnlySimchas and the answer to this unfortunate situation was that the server for OnlySimchas crashed during an overload of people using OnlySimchas as there had been a rush of engagements so that people could get their pictures onto OnlySimchas in time for their doors in their dorms to be decorated by their friends before everyone left for the winter break – phew! ….This little glimpse into the way engagements are conducted now that we have OnlySimchas.com is priceless. And it can make you cynical …But am I overlooking something here? Yes, the answer to the enormous benefits offered through OnlySimchas is very clear and simple – it is the incredible, delightful, innocent and pure emotion that should be deep at the heart of all of us when someone else is happy – we should also be happy!! In today’s society that runs on UTube and MySpace where everyone wants their fifteen minutes of fame, OnlySimchas is the Jewish version. Fame continues with OnlySimchas because now everyone who shares simchas with OnlySimchas also gets their simchas announced on JM in the AM. Now there is only one other complication before we get carried away by the sheer beauty of OnlySimchas - that the above cynicism still may hold true. Nothing is perfect, people are always going to take the pure joy generated by OnlySimchas and subvert it. One misdirected person wrote an article for JewishHigh.com deciding that those happy smiling faces in OnlySimchas were really a prelude to divorce and that the angelic faces of new born babies on OnlySimchas were only years away from becoming photos on Americas Most Wanted due to the dysfunctional families they were going to grow up in. In other words – who are OnlySimchas fooling? But we have to go back to our basic tenet in romance and dating as epitomized by OnlySimchas– we all want to believe in a happy ever after ending and that is what OnlySimchas is giving. Suzanne Zettel is a Jewish Matchmaker on JRetroMatch and works with Jewish Singles all over the world. She has her Masters in Social Work from Leeds Metropolitan University and has worked as a Family Guidance Counsellor in Toronto, Canada. As an employee of JRetromatch, Suzanne is able to use her many life experiences and challenges to truly reach every one of her members, opening up their hearts and souls so they can receive and appreciate the many joys of Jewish dating and marriage. She currently lives in Israel.